When I first tried to understand Bridge pattern, I got it confused with Adapter pattern and then Abstract Factory pattern. In my defense, these patterns do have features overlapping. But when I got into depth of bridge pattern, the advantages got clear i.e. decouple an abstraction from its implementation so that the two can vary independently. This entry was posted in Design Patterns and tagged Design Patterns on September 3, 2013 by admin. Adapter design pattern is probably one of the simplest, yet very useful design pattern. Let’s take and example, you have a device which runs on Direct Current (DC), but in your home you have supply of Alternate current (AC). What will you do? Go to an electronic shop and explain the problem, the guy in shop will give you an AC to DC ‘Adapter’. What it does is basically takes AC as input and provide DC as output for your device. Similar problems are faced at times by developer, especially when they are using API from third party or legacy code. Say you are using a Tax class API (you do not have code) which takes integer to calculate tax in its getTax method, whereas your code stores the data in int. One way is to convert the format at every place in code where ever you are using getTax. A second and simple ‘Adapter’ way will be to create a TaxAdapter class which will have a getTax in it, which further calls getTax of Tax class. The only responsibility of TaxAdapter is to convert the data into a format which is expected by Tax class(double to int, AC to DC). This entry was posted in Design Patterns and tagged Design Patterns on August 30, 2013 by admin. You must have used DocumentBuilder or StringBuilder classes if you have worked with core Java. Buider pattern is simple object creation pattern, which helps handling of creation of complex objects by breaking the object building exercise into multiple easy steps. To make it more useful in handling higher complexity, we can create the CarBuilder as Abstract Class or interface, which is implemented by HatchBackBuilder, SportsCarBuilder etc. This entry was posted in Design Patterns and tagged Design Patterns on August 25, 2013 by admin. Prototype is a creational design pattern. When I first read about it, I got it a bit confused with Factory pattern. If you look at Car Factory example, where the factory helps us create a “new” car at run time, and we can choose whether we want a Sedan or Hatchback while the car creation. Prototype pattern differentiates itself from factory pattern, by providing prototypes of objects beforehand, and creating a copy at runtime. Extending our Carfactory example further, lets say now we are not limited to 2 set of cars, but we have ready prototypes say a car called Swift, Ritz, Figo, Scorpio, all with their specifications already defined. At runtime, we will just create a copy or clone of the car which user needs. Note that we can actually build our prototype pattern on factory pattern, but for simplicity of this example we will stick to a simple implementation of car by these objects. One important difference between factory and prototype is that prototype pattern creates a clone and factory pattern create a new object. When a new object is created using a new keyword, it makes sure that user get a object with fresh state. Whereas in clone (prototype), we are making sure that we are also copying a particular state of object. This also helps us understand when to use factory and when prototype should be preferred. In my attempt to over simply things, I will try to go back to factory pattern and the example I used for CarFactory, http://kamalmeet.com/2013/06/factory-pattern/. The idea was simple with CarFactory, that user knows he wants a car, but which car is to be created is decided at runtime. AbstractFactory Extends the idea a bit further, it gives us a factory of factories. 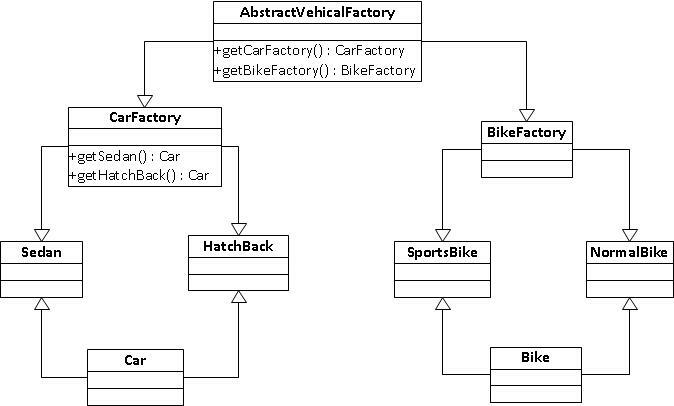 To understand the above diagram, lets extend our CarFactory example, lets say we know that we need a vehicle to start with but we do not know if it will be a car or a bike (decided at runtime). So we will have 2 concrete factories- CarFactory and BikeFactory. CarFactory is responsible for creating Sedan or HatchBack as previous example and BikeFactory is creating SportsBike and NormalBike. On top of the concrete factories we will introduce a AbstractVehicalFactory which is implemented by CarFactory and BikeFactory. This entry was posted in Design Patterns and tagged Design Patterns on August 13, 2013 by admin. Factory pattern and Strategy pattern might create a confusion if you are using them for the first time. Atleast I was confused, so I tried to analyze the two patterns further. Let’s relook at the two examples which we used for factory and strategy pattern. Car Factory- A factory for creating Sedan or Hatchback car at the run time based on user need. Tax Calculator- To pick at run time which type of tax to be calculated (Indian or German). The difference lies in the usage of two examples above. 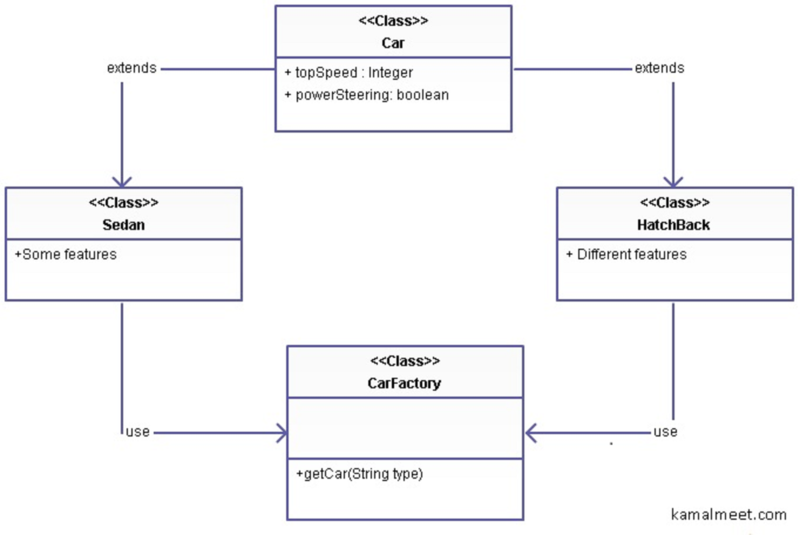 In first example we are creating object of something, so we can conclude factory pattern is a creational pattern. In second example it is clear we are trying to achieve a goal / execute a method based on input, hence strategy pattern is an operational pattern. This entry was posted in Design Patterns and tagged Design Patterns on June 7, 2013 by admin. Factory Pattern is one of the highly used design patterns. The reason being , its genuine usefulness and closeness to real world. Let’s take a very simple real world example to get started, and then we will map it to the pattern. Let’s say we have a Car factory which creates many types of cars. To keep it simple, let’s say it creates 2 type of cars- hatchback & sedan. These two type of cars will have many similar attributes like top speed, power steering etc. but there will be some features explicit to type of car (say a back seat AC or TV is available only for sedan cars). What will be a natural Object Oriented Design for this arrangement? If you know what type of car you need beforehand, we are good. But in case you need to create the car at runtime, say on user input, you will need some helper class which will create specific type of car at runtime. This class is our factory class. A better example in technical terms might be that your application supports multiple database types (say on test environment you use MySql whereas on production you have Oracle). A DataBaseConnectionFactory can help you get connection of specific type of database at runtime (say reading the database type value from some property file. This entry was posted in Design Patterns, Interview Questions and tagged Design Patterns, Interview Questions on June 6, 2013 by admin. Here is summary of what I have written so far on singleton patterns. The examples taken here are mostly from Java. Gives a basic idea of singleton pattern is all about. The difference between two types of instantiations, and which one is better under what circumstances. Issues with using singleton, how to make your singleton classes threadsafe. Sometimes people confuse between singleton and static classes. When should one use them and why? This entry was posted in Design Patterns and tagged Design Patterns on April 17, 2013 by admin. A side effect of using singleton class: as the constructor of the singleton class is private, you cannot create a subclass of a singleton class, but in most of the cases that is desirable. Additionally you can declare the class as final to explicitly show that the class can’t be subclassed. But in case if it is required to create a subclass of singleton class one can define the constructor of singleton class as protective instead of private. block simultaneously, it will create two different instances of the class. This is an undesirable condition and cause unwanted behavior in the application. Also note here that in case of eager instantiation this problem does not occur as the instance gets created beforehand. Making your singleton class thread-safe is easy, you just have to make your getinstance method synchronized.